Going into the penultimate round of the ladies SM qualifier, our girls were still atop of the qualifier rankings, and with tough and even games with the rest of the group in previous rounds, everyone knew round 3 would be just as competitive. Malin Andersson, Océane Chabrol, Cecile Kaminksi, Sara Kaminski, Agnes Lindgren, Cornelia Norén, Meliha Mehmeti, Elizabeth Sonnenholzner and Martina Vivlund. Having faced an understrength Pingvin side in the previous round, everyone knew that we would be faced with a stronger Pingvin side on their home patch, and as expected the girls from Trelleborg turned up this weekend at full strength. Despite this, it was Lugi who were first to get on the scoreboard following their own scrum early on in the half, which having scrappily been hooked out, was cleaned up by Sonnenholzner who sent the ball on it’s way down the back line and eventually ending up in the hands of Martina, who cruised across the line to make it 5-0 to Lugi. Sadly for our girls however, it would turn around from that moment in the favour of the home side, with our ladies not getting much of a say in the rest of the game. The remainder of the match can be summed up simply as our ladies not being able to secure their own possession from set pieces and Pingvin being a lot more aggressive in and around the contact area, leaving the team with only scraps to live off. With Pingvin converting their chances as they came along, they eventually ran out easy winners, putting our ladies on the back foot in the race to finish in the final. The day’s second game saw us taking on the team that lay bottom of the series rankings, Ronneby, a team that had been strengthened from the previous week with the addition of some players from their farmer team, Wexiö. As usual, Ronneby were no pushovers, as despite heavy defensive pressure from Lugi, they eventually broke round on the outside of our defence, only for Sandra to make the try saving tackle down the touchline. Having once again failed to execute their own set piece, Lugi conceded possession to Ronneby, but our Lionesses were the ones to benefit off of the ensuing phase of possession after Ronneby’s handling errors popped the ball up into the arms of the awaiting Sonnenholzner, who took off up the middle of the pitch before passing the ball into the waiting arms of Vivlund to take under the posts for the try. From there the team got into a little tussle (metaphorically!) with the referee, with the man in the middle asserting his dominance and pinning our girls back time and again. But it was Lugi who would put the next points on the scoreboard, following a scrummage win against the head and some quick hands to Cornelia in the centre, who streaked away to extend Lugi’s lead to 12-0. 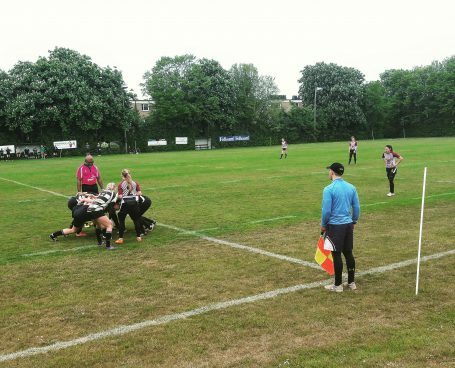 Having dominated the first half on the scoreboard, the second half would see Ronneby reverse that trend as they won the second half 12-7, with Elizabeth scoring Lugi’s only try. From a performance perspective the team learnt that mentally dropping focus can cause problems even against sides that should be handled easily, and whilst the win was a positive on the day, there was much still to work on. This game would also see the team losing Sonnenholzner for the remainder of the round following the re-aggrivation of a small niggle suffered during the previous week’s competition. Final Score: Lugi 19 – 12 Ronneby. Having lost to Malmö twice in the previous round’s games, the team knew that this was not only a big game in terms of determining who went into the day’s final, but also in terms of trying to regain a little of the lost pride from the previous weekend’s defeats. However, whilst round 2’s games were fairly close, this one turned into a one sided affair in favour of Malmö. Whilst our ladies enjoyed a great deal of possession, protecting the ball well and stringing together multiple phases, they were unable to find a way through the Malmö defence. Whilst the opposition can be commended for their grit without the ball, Lugi only had themselves to look to as it was the team’s inability to get the ball to the space and around the opposition that proved to be decisive. The first half, although resulting in a 12-0 Malmö lead, was a well played and even affair, with scores only coming off of well taken opportunities, nothing for our girls to be unhappy with. But it was the second half that was to hurt the most from a Lugi perspective as Malmö seemed to go uncontested in their quest to get over the whitewash, eventually running the score up to 31 points in their favour. With that said, Lugi can be proud of how they finished the game, having finally got around the edge of the oppositions defence with a break from Martina and following some good support play from the rest of the team, Sandra Olofsson was able to dot down over the line to finish the game on a high. Final Score: Lugi 7 – 31 Malmö. Whilst the ladies dropped down into the lower half of the final placings matches, it was still all to play for, as in such a tight qualifier, it was key to come away with the 10 points awarded to the 3rd place finisher. Once again the girls faced Ronneby, who had failed to beat us on any occasion so far this season, but had pushed us close earlier in the day. Again the ladies ended up in a tight and tense match, that saw an early try for Lugi coming through the tough running of Sara Kaminski as she crossed the line from close range. But with Ronneby finished the half strong with their own try, the second half was massive in terms of our SM qualification. Lugi managed to keep their trend of starting the halves on the front foot when Martina broke through the oppositions line to take the score to 12-5. Unfortunately for Lugi, that was not to be the killing blow, as Ronneby were able to claw themselves to within two points with only minutes to spare, making it anyones game as the clock wound down. However, any worry that the Lugi coaching staff had after Ronneby’s try, was immediately quashed following the kickoff, as a safe recovery by Agnes enabled her to go forward in order to create a nice offload opportunity for the awaiting Cornelia, who stormed 60 meters for the decisive try. Finals Score: Lugi 17 – 10 Ronneby. 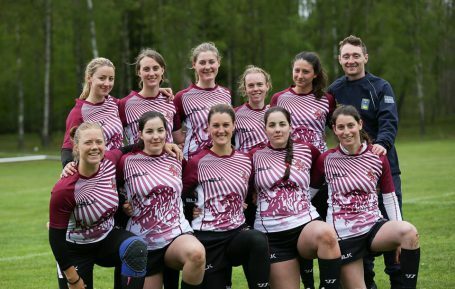 With that, the ladies secured a third place finish and 10 points, leaving us joint top of the table on 42 with Malmö going into the last SM qualifier on the 4th of June in Malmö. 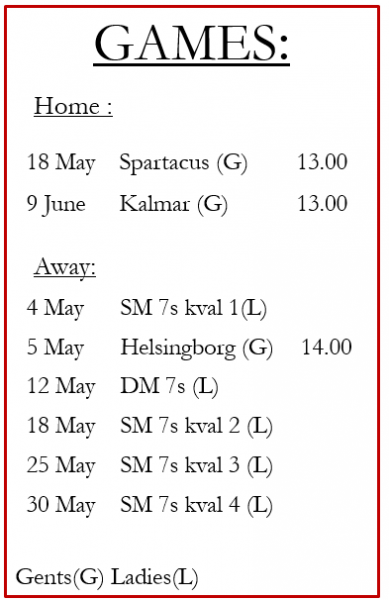 Whilst the ladies place at SM Veckan is not ensured yet, a 3rd place finish in the next round is enough for qualification no matter what happens in the other two regions, whilst a fourth place finish would see us depending on Enköping not winning the next North qualifier to get us to Norrköping. (*disclaimer: this is according to the coaches math skills and interpretation of the qualifier rules, thus not 100% certain). This entry was posted in Match Report, News, Women's Team and tagged 7s, lund, Pinguin, rugby, trelleborg, worldrugby, wrugby on May 24, 2016 by Ross.